Which insulation style will warm your heart? Posted 3:36 pm by Mike & filed under Garage Door Tips & Tidbits. Polystyrene (like the white coolers) is a sheet of insulation and fits inside the door panels. 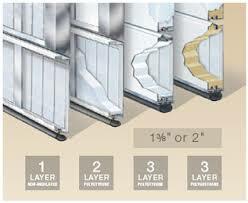 Polyurethane (spray foam) is an expanding insulation that gets into all of the crack and crevices. You can get Raynor and Clopay doors with either type. It just depends on what you need…of course you can also get a door with none.